Forgiveness is the best form of offence. It frees you from suffering__caused by the pain inflicted by someone__and helps that someone reflect and repair from whatever they have done unto you. It’s a win-win. Think deeply and you will agree with my perspective. Often times people hurt us with their actions, thoughts and utterances. They lie on us, they betray our trust in them, they speak ill behind our back, they take away what is rightfully ours and they leave us numbed. None of this feels good. The first, obvious, logical response, in all such situations, is to freak out, scream, kick, demand why, seek to know why were you betrayed…..and eventually, over a period of weeks, the angst morphs into a ‘certain coldness’ and eventually, you stop trusting people. While this may seem a normal and appropriate response in “self-defense” (so that you are not betrayed one more time), the flip side is it will leave you perpetually grieving. And how can you live fully, peacefully, if you are forever in a state of suffering? Here’s a Zen story that will sensitize you to the perils of carrying the baggage of being ‘unforgiving’! 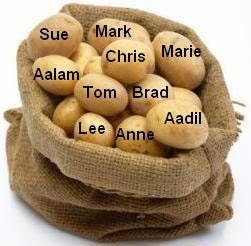 Once there was a monk who asked his disciples to carve out names of the people they cannot forgive on potatoes, one potato for each name. Then the disciples were asked to put all their potatoes in a sack and carry it with them at all times for one week. The longer the time went by, the heavier the potatoes seemed to have become. To make the matter worse, those carved potatoes also started to rot and smell bad. It was such an unpleasant experience for the disciples. At the end of the week, the Master asked, “So, what did you learn?” At once the disciples told the Master that they now realized that holding on to grudges only brought negativity to them. Asked how they should go about correcting it, the youngsters said they should strive their best to forgive everyone that used to cross them and made them angry. The Master then asked, “What if someone crosses you again after you unload this present load of potatoes?” The disciples suddenly felt terrified at the thought of having to start all over again with new potatoes, week after week. “What can we do if there are still other people crossing us? We cannot control what other people do to us!” they confessed. At which point the Master replied, “So far we only discussed the conventional way to approach forgiveness, that is, to strive to forgive. Striving is difficult. In Zen, there is no striving.” Seeing the disciples completely at a loss then, the Master further suggested, “If the negative feelings are the potatoes, what is the sack?” The disciples finally grasped it. “Ah, the sack is something that allows me to hold on to the negativity. It is my inflated sense of self-importance!” replied one of them. And that was the lesson of this story. Once we learn how to let go of the sack, whatever people say or do against us would no longer matter. So, for the thinking, strategizing, master-craftsmen and wonderful upwardly-mobile wise women of the modern world, I would say, choose forgiveness to be liberated, to be free. Also consider forgiveness as a form of offence in today’s world. A peaceful resistance to the crude, unethical practices that attempt to derail you, your career and your Life. None of this is my original hypothesis, let me hasten to clarify. Here are the words of Christ found in his teaching in Matthew 5-38-48: “But I say to you , love your enemies, bless those who curse you, do good to those who hate you, and pray for those who spitefully use and persecute you.” Loving someone who loves you is easy. Loving someone who hates you is difficult. So, whether it is a challenge like an exciting new electronic game (like Angry Birds!) or a form of offence or a tool to freedom, forgiveness makes imminent sense. Only, of course, if you want it to!